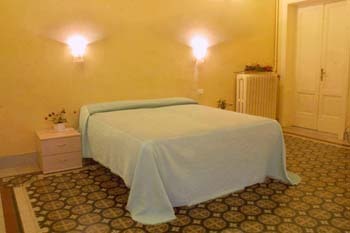 HOTEL FIORITA, AND YOU ARE IN THE HEART OF FLORENCE ! An elegant building in the historic center of Florence, just a few minutes from Santa Maria Novella Station: a warm familiar atmosphere, elegant surroundings and quality services. For that once in a lifetime holiday in Florence, the cradle of the Renaissance. Hotel Fiorita is located in an elegant building dating from the early twentieth-century in the historic center, just a stroll from Santa Maria Novella Station and the most interesting historic and artistic sites in Florence. The hotel is very welcoming and comfortable, ideal for a romantic holiday for two or to relax with friends or the entire family. A warm, familiar atmosphere greets you on your arrival and will accompany you throughout your stay: you can avail of a series of exclusive services to make your stay in Florence as unforgettable as possible. Each morning guests can have a delicious sweet or savory buffet breakfast, which is served in the wide terrace with splendid sight on Florence. A bar service is also available on request. We are at your complete disposal to advise you on local typical restaurants, to book tickets to shows and exhibitions, tours of the city and its surroundings and a trip to the famous Mall, a haven of clothes outlets located in Leccio Reggello, just outside Florence. Our rooms are big, bright and fitted with high quality comforts such as air conditioning, a minibar, direct telephone line, satellite TV and a safety deposit box. Some rooms also have modem sockets. The furniture, services and types of rooms were designed to make your holiday in Florence as pleasant as possible, while trying to meet your every need. 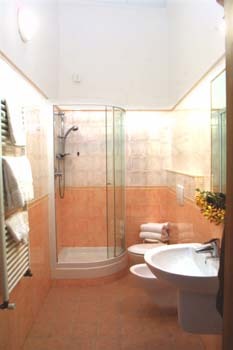 Hotel Fiorita offers single, twin, triple and quadruple rooms which are ideal for a holiday with friends or family, all with a comfortable private bathroom with a shower and hairdryer. Some rooms overlook a quiet courtyard or the Duomo. 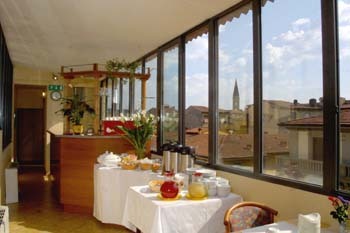 Recently renovated, Hotel Fiorita offers, beyond other amenities, a beautiful breakfast room with view over the City. All rooms are well equipped with colour sat TV, minibar, safe, Hair dryer in the bathroom, air conditioning with individual remote control. Hotel Fiorita is just 30 meters from Santa Maria Novella Station and a few minutes from the most interesting historic and cultural sites in Florence. 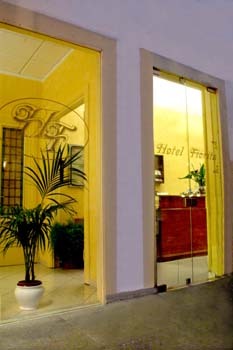 The hotel is an elegant starting point to visit the city: it is just a few minutes walk from Santa Maria Novella Church, the Basilica of San Lorenzo, which hosts works by Michelangelo and Donatello, the characteristic San Lorenzo Market, the Accademia Gallery and the Duomo, with Giotto's famous bell tower. 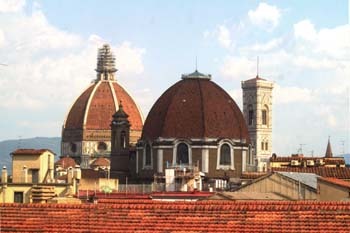 Florence is an important business center, as well as an artistic and cultural center. Hotel Fiorita has an extremely strategic position from this point of view: the Palacongressi is just 50 meters away and the Fortezza da Basso exhibition halls are just 100 meters away. this time first night charge might apply. Coming from Milan and Bologna (A1 highway) take the "Firenze Nord" exit and follow the directions for "Centro Città/Stazione Santa Maria Novella". You will see Via Fiume circa 30 meters from the station. Hotel Fiorita is at no. 20. Coming from Rome (A1 highway) take the "Firenze Sud" or "Firenze Certosa" exit and follow the directions for "Centro Città/Stazione Santa Maria Novella". You will see Via Fiume circa 30 meters from the station. Hotel Fiorita is at no. 20. Coming from Genoa or Pisa (A11 highway) drive along the highway to the end and follow the directions for "Centro Città/Stazione Santa Maria Novella". A shuttle service is available from "Amerigo Vespucci" Florence airport which conveniently brings you to the city center. Another option is a private taxi which brings you directly to the hotel. You can reach Hotel Fiorita on foot from Santa Maria Novella Central Station: take the "Piazza Adua" exit which is on your left when coming from the platforms. Cross the street and turn left for Piazza Adua: you can see the hotel from here, located at no. 20 Via Fiume. The walk from the station to the hotel should take about 4 minutes. Nearest airport: AMERIGO VESPUCCI - "PERETOLA"